structure comprising Personal Finance Planning Services. The drastically evolving financial markets, global interests and changing taxation requirements bring up new challenges for CPAs and financial advisors. Under these circumstances, maintaining a firm grip on the market and stabilizing financial life can be extremely tough. In these challenging times, handholding service by CPAs to its clients can streamline the process of financial planning for future and allow better wealth management. 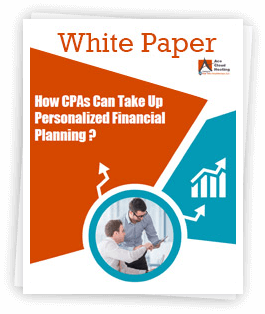 Talking about finance management but failing to mention ‘Personal Finance Planning Services’ can cut down the chances of greater success in CPA firms. CPAs offering Personal Finance Planning (PFP) services can open doors for additional revenue flow and better staff retention. Practicing and deploying PFP services can make clients understand the unique challenges faced by CPAs while managing their wealth. It also ensures the better mental health of the clients and expands opportunities for winning new customers. Certainly, addressing some of the crucial aspects of an investors’ or clients’ financial life can make a significant difference to your business proceedings. Supported by a survey revealed by the Journal of Accountancy, 83% of the CPAs surveyed offer both PFP, and other services said that they never or rarely lost tax clients due to financial planning-related issues.